Apex is located in Wake County, in the piedmont region of North Carolina. Apex is a suburb of Raleigh and is often referred to as “The Peak of Good Living,” or the Peak City. 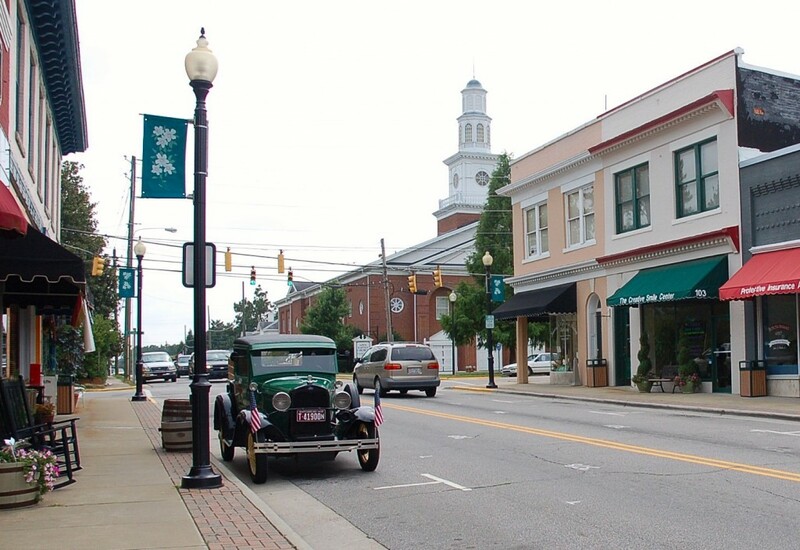 In the photo is downtown Apex, a district on the National Register of Historic Places. The Town of Apex was incorporated in 1873, named for its location at the highest point of elevation on the Chatham Railroad. The surviving town center is now one of the most intact railroad towns in the state. The town grew slowly throughout the 1950s and saw additional booms in development with the opening of Research Triangle Park. The town grew greatest during the 1990s, seeing a quadrupling in population. In recent years, Apex has seen continuous growth. A shopping center installation at the intersection of Highways 64 and 55 has attracted many individuals to the area, causing the addition of several new neighborhoods as the town grows west. 2009: CNN/MOney magazine ranked Apex #44 on its list on the nation’s top places to live.